Based on the Team Losi Racing 22 race platform, the all-new Losi 22S SCT RTR has taken the performance and durability of the 22 platform and maximized it to become the ultimate Ready-to-Run performance/basher. The 22 platform is a legend in the radio control racing world and this new Losi version is ready-made for racing while keeping the appeal of backyard bashing. A powerful Dynamite brushless system provides abundant power thats completely manageable with the aid of AVC (Active Vehicle Control) technology. The get-up-and-go of the 22S is easily handled by the race-inspired suspension of the championship winning 22 race platform. 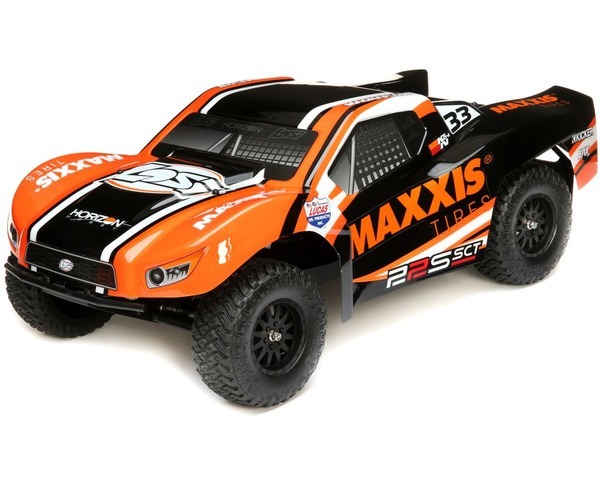 Several Team Losi Racing 22 platform performance parts can upgrade the look, style and performance of the 22S RTR. With user-friendly design concepts, like a bottom loading battery compartment and hard mounted electronics, the user experience is hassle-free allowing the bashing to begin right away. 2S or 3S LiPo Battery with EC3 connector and suitable battery charger.